The Staghorn Sgain Dubh has a genuine deer horn handle backed with blackwood. 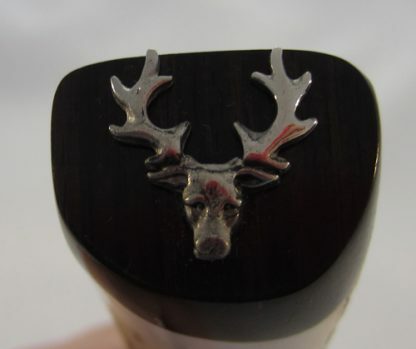 The top of the grip is also blackwood with a stag head decoration on the top. 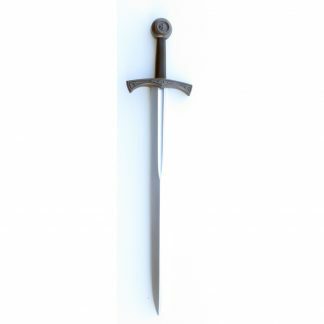 The sheath has a rope work design on black leather. This Staghorn Sgian Dubh is finished with blackwood on the back and on the top. The top of the grip has a stag head shaped decoration on the end. 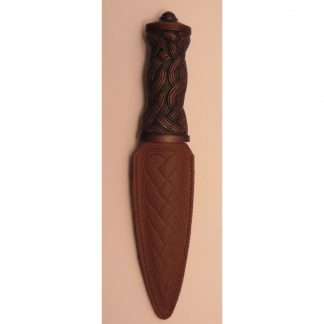 The sheath is black leather with a rope work design. The grip is made from genuine deer horn. 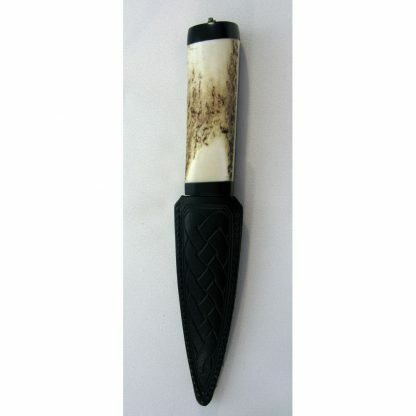 Each Staghorn Sgian Dubh is handmade and therefore unique. No two are alike. The horns used are naturally shed. Each year, the stags drop their antlers. As a result, the use of staghorn does not cause any harm or endanger the species. For safety reasons, all blades are blunt. Each of these sgian dubhs comes in in a gift box. Maker: The Sgian Dubh Co.